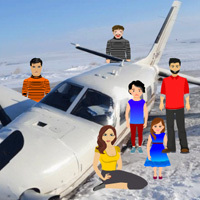 Wow Plane Crash in Snow Escape is another point & click escape game developed by WowEscape. In this game, you came to know that a plane is crashed. But unfortunately, you missed the way. You have to find the way and rescue the people by finding useful objects, hints and by solving puzzles. Click on the objects to interact with and solve puzzles. Good luck and have fun! Anyone here? I need some help with the colour/shape puzzle in second set. I have a clue but don't understand it. Still stuck in the first set of scenes - where is the clue for the letters? Where to use the roller (ravioli) and ice? Ah - ice goes in pond! for missing scate - one pizza cutter is for the hole in scene with snowflakes. hi ppl! where did u use the bucket with snowballs? ty! hint for colored dots connecting puzzle? Why are they making winter wonderland games? We are in Summer, yes? i'm sorry but the color/shape clue is just plain wrong.